The foundation of every exceptional landscape is an excellent design. 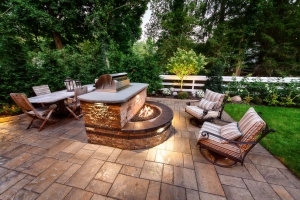 At Castle Point Landscape Design, we take pride in crafting outdoor spaces that are beautiful, functional and will endure for years to come. No matter the project size, our reputable team believes that landscape design is an art rather than a one-size-fits-all solution. As a result, we work with you to select the best approach for your budget, lifestyle and personal taste. And, most importantly, we deliver total satisfaction throughout every project phase—because we want you to absolutely love your new space, down to the smallest detail. Increased Property Value. Imagine visiting an office building with colorful trees and shrubs that are thoughtfully planted across the grounds. Or, picture arriving at a home that has an outdoor kitchen and soft landscape lighting. You’ll remember these properties because they caught your attention from the moment you arrived. Innovative landscape design and construction solutions help you to achieve just that. They enhance your curb appeal by maximizing both your indoor and outdoor spaces—and by creating a landscape that potential buyers will fall for. Cost-Effective. Professional landscape design can reduce your monthly bills, too. You see, strategically planted trees and shrubs can provide shade over an air conditioning unit, therefore reducing the amount of energy needed to keep your home or office cool. So, you can make your house stand out and trim your electric and energy bills using natural features. Added Privacy. Landscape design solutions can also help keep prying eyes off of your beautiful property. Large trees will beautify your space, while partially secluding the property and creating a sense of privacy. You can also consider incorporating lush shrubs into your yard to create a barrier. Castle Point Landscape Design experts provide a full range of landscape design service offerings, whether you require small modifications to your yard or a complete revamp of your grounds. At Castle Point Landscape Design, our goal is to provide you with options and make recommendations that best suit your needs. This process begins with an in-depth dialogue. During this discussion, we listen to your concerns and develop a solid understanding of your objectives. From there, we work with you to select the best approach for your budget, lifestyle and personal taste. Before work begins, we will first present a detailed plan and suggest specific elements. And, perhaps most importantly, we will work alongside you through every project phase–from conception to completion–to design and build a landscape that not only meets, but exceeds your expectations. To reinvent your Northern New Jersey landscape, expand your living area or boost your home’s curb appeal, trust the Castle Point team! Call 908.512.2267 or email our team of NJ landscape designers today.